How are you handling your heavy lifting needs? If you’re still using manual pallet jacks, consider looking into the benefits of electric pallet jacks, sometimes referred to as an electric pallet truck. The manual pallet jack still has its range of uses and applications, but for some projects, investing in electric saves time, and even money. Electric pallet jacks are efficient, affordable, and ideal for heavy lifting in confined spaces. Not familiar with the electric pallet jack and its benefits? Keep reading to learn what an electric pallet jack is, and how it compares to manual pallet jacks. You probably already use some form of pallet jack for your smaller heavy lifting needs. Because of their smaller size and maneuverability, they’re ideal for picking things up in tight spaces such as warehouse aisles. An electric pallet jack uses energy to lift, generally from a battery pack, versus traditional pallet jack methods. This makes them able to cover a lot of distance, in less time than manual pallet jacks. When you’re able to cover more distance in less time, you can expect increased productivity as a result. At this point, they may sound very similar to a forklift, but remember: a forklift is larger, and much more expensive. Forklifts are ideal in larger, less-crowded areas for the heaviest lifting. Electric pallet jacks are more compact, quieter, and cost efficient. The manual pallet jack is not in any way obsolete, but there are several differences between the two, and many benefits of electric. 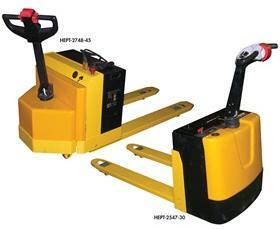 First of all, manual pallet jacks function by hydraulics and a pump handle. It takes time to lift and push with manual/hydraulic, which is where electric becomes a huge benefit. Using power to control motorized transport, electric pallet jacks simply get the job done faster. Not to mention, while super-strength is not required to use a manual pallet jack, it does put some physical strain on the user. Usually, manual pallet jacks cannot handle the same load an electric pallet truck can, since the lifting and pushing for power jacks is completely handled by battery power. The S.W. Betz Company, Inc. has been providing businesses in Maryland and beyond with all of their essential Weighing, Material Handling, Dock, and Warehouse equipment since 1933. We have multiple pallet jack options, including electric pallet jacks, for your lifting needs. We also carry a variety of pallet jack manufacturers, including electric pallet jacks from quality brands such as Wesco and Vestil. If you would like to learn more about electric pallet jacks, please contact S.W. Betz by calling 410-574-1414 or 800-332-0322 today! You can count on the S.W. Betz Company to work with you and provide you with our extensive knowledge of the industry. This entry was posted on Wednesday, November 18th, 2015 at 4:39 am. Both comments and pings are currently closed.